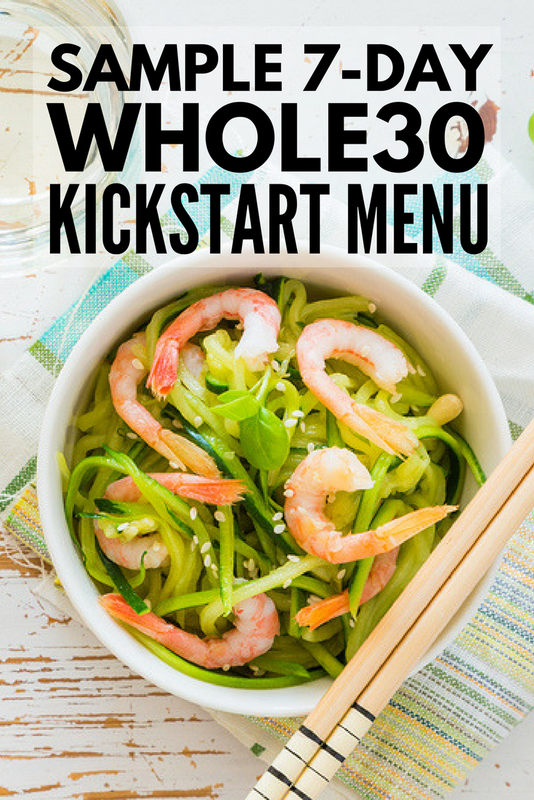 Whole30 Eating Plan: Your Complete 1-Week Kick Start Guide! To be totally honest, when it’s not the holidays, I’m sad to have no excuse for eating all the gluttonous comfort foods and sweets I can get my hands on! On the other hand, when it’s all said and done, I’m excited to get a healthy fresh start, whether it’s the New Year or the middle of summer. Enter: The Whole30 Week 1 Eating Plan! …an awesome guide to get your health and fitness back on track! If you’re having trouble losing weight or feel tired and unmotivated, the Whole30 diet can be a game changer for you. You may not realize it, but there are certain foods and ingredients that are negatively affecting you on the daily, and they result in long-term consequences as well. Stripping your body of these less healthy foods is what Whole30 recipes are all about. Whole30 is a system that works to cleanse your body of hormone-unbalancing, inflammatory food. You’ll feel better, look better and have more energy to take on your busy days! If you’re not familiar with the Whole30 eating plan, it’s based on the idea that some foods, such as sugars, dairy, grains, and legumes, negatively affect our body – both physically and psychologically. Think about that bagel or two pieces of toast you have every morning…unfortunately they are mostly carbs, which we all know goes straight to the hips – unless you are doing an extra workout every day! And those happy hour cocktails? Mostly sugar, unfortunately. It’s not that sugar, a bagel or toast are terrible in moderation but after a period of heavier consumption (like the holiday season) it can really help you feel less sluggish to do a reset. Following the Whole30 diet plan, you cut out all the bad-for-you foods and replace them with nutritious, natural whole foods. Over on the Whole30 website, it’s explained as a “short-term nutritional reset” completed in 30 days to wipe out unhealthy cravings, boost your metabolism and promote a healthy digestive tract and immune system. Wholesome, natural foods include foods like eggs, veggies, fruits, almond butter, meat, and seafood. It’s not a plan that deprives you, but rather fills you up with healthy, real foods instead of processed, sugar-filled junk. I realize this doesn’t sound like a ton of fun, but that’s why I went through a bunch of recipes online to find a delicious list of Whole30 week 1 meals. This way you can get an idea of what foods are approved on the plan, and you can see how yummy they look! You’re not required to count or restrict calories – the main point is filling your body with good-for-you foods. By eliminating sugars, dairy, alcohol and other foods, you’ll naturally slim down as your body will be less inflamed and irritable. The plan aims to get your body back to its healthy, natural state and recharge from there. Chronic inflammation affects over half the total population of Americans, and is associated with everything from obesity and diabetes to hay fever and arthritis. Diet has long been linked to inflammation, and by eating the right foods and cutting out refined sugars, carbohydrates, processes oils and other junk foods we can all improve our health! You can check out all the Whole30 rules in Melissa Hartwig’s book, The Whole30: The 30-Day Guide to Total Health and Food Freedom, but stay away from legumes (including peanuts! ), soy, alcohol, refined and added sugars, dairy, MSG, sulfites, and grains. These are the foods that lead to inflammation and are psychologically unhealthy. Another rule of Whole30 (That I Love)? You are NOT allowed to weigh or measure yourself while going through the program! You can weigh yourself before and after to see your results, however, during the program you’re encouraged to focus on how you feel and the benefits the whole foods are bringing to your body. More and more health and fitness experts are promoting the idea that your weight isn’t always the best measure of overall health, so I’m totally on board with this methodology. Whole30 is definitely about having more energy to tackle your life and less about keeping track of what the scale says! 30 Day Whole Food Challenge: Award Winning Recipes Guaranteed to Drop Weight. But before we dive into the recipes, I want to share some tips I’ve learned from my experience to make your Whole30 diet a total win. As you can imagine, the Whole30 diet can be challenging when you suddenly realize you can’t have that cream in your coffee, or ketchup (because of the sugar) with your burger. (No bun either!) So in order to avoid a total meltdown which lands you straight into a bowl of ice cream, keep these five tips for success in mind. MEAL PLAN MEAL PLAN MEAL PLAN!!! Your success with Whole30 will depend on your ability to plan your meals AND plan for snacks. Because you’ll be off of sugar and other refined foods, you might end up with cravings that are hard to control. Add that to a very hungry feeling and an empty fridge, and you could wind up defaulting to your favorite pizza place before you even realize it! Invest in a set of portion control meal prep containers and check out our best meal planning tips to help you stay on track here! EATING OUT ON WHOLE30 IS HARD. It’s not impossible, as long as you know where to get things like a good salad with grilled meats (but without cheese)! But it can be tough to do on the regular, so keep that in mind when making plans during the 30 days. And remember – it is only 30 days! You might have to push back a dinner date or two, but it won’t be forever. You’ll find things go more smoothly on Whole30 when you are regularly cooking at home. HAVE SNACKS ON HAND. See tip number one. I want to stress this one separately though, because you won’t find too many Whole30 approved snacks in the breakroom or vending machine at work, or on your to-go menu. Keep nuts, cut up veggies and fruit handy for those hangry moments! IT’S A DETOX – SO BE PREPARED. When you cut out sugar, alcohol and all those delicious refined carbs, your body is going to notice. And it might not feel so great during the first couple of days. So if you start to worry that you are getting crabbier than usual at your spouse, kids or coworkers, know that it’s probably the Whole30 starting to work its magic! Your system will re-regulate and you’ll start feeling awesome by the end of Week 1, but if you’re really struggling to get through the day, we’ve got some tips to help you survive the ‘low carb flu’. MAKE IT WORK FOR YOU. If you know you have a family reunion, wedding, birthday celebration or other big event coming up, hold off on starting the Whole30 diet. We’ve all got busy lives, and you probably won’t be able to plan around everything. But take your schedule into consideration and try to find a relatively low-key month in terms of your social calendar to complete the challenge. We’ve taken it upon ourselves to create a 1-week meal plan of Whole30 menu ideas just for you! We’ve included breakfast, lunch, dinner and snack recipes for each day of the week so you can start the plan off right! You’ll quickly notice there’s still so much you can eat when you eliminate the foods that are bad for you. The beginning of the year is a great time to reset your eating habits for the year ahead, but this Whole30 meal plan works great any time of year. After seeing how much better you feel (and how many options you have) on the Whole30 plan you’ll likely want to eat more whole foods all the time! So why not start now? The Whole30 week 1 recipes below can be re-used, saved for leftovers, or prepared in batch so you don’t have to keep buying tons of different ingredients. The options are endless with the Whole30 eating plan so go ahead and get started now! I totally love the Turkey Avocado BLT salad (because of the bacon, basically). But I also love the idea of taking a sandwich and turning it into a salad! A spiralizer is a must for anyone considering Whole30 or other paleo-type eating plans. It let’s you make noodles out of almost any vegetable, which means you still get to eat your favorite spaghetti dishes without going off your plan! These almond butter and banana sandwiches are sooo cute and creative. Not to mention delicious and kid-friendly too! OK, homemade Larabars? Yes, please! And check out the lunch item – there’s that sandwich-turned-salad idea again. Genius. Does everyone see the word “pizza” on this list? OK, so you have to get used to things like pizza without the crust, but I’m thinking those are still going to be amazing. Any eating plan that still allows for guacamole is OK in my book. Use it as a dip for sliced red pepper, carrots or cucumbers – you won’t even miss those deep-fried tortilla chips! The Simple Chicken Curry looks amazing, is quick to make and is full of vegetable goodness. And you can serve it with rice for family members who are not on the Whole30 plan. There you have it, your Whole30 week 1 guide to start off the Whole30 eating plan! The recipes are just as delicious as they are healthy, so you can feel good about whipping them up for you and your family! Good luck! If you liked this guide to the Whole30 eating plan, please share it on Pinterest!